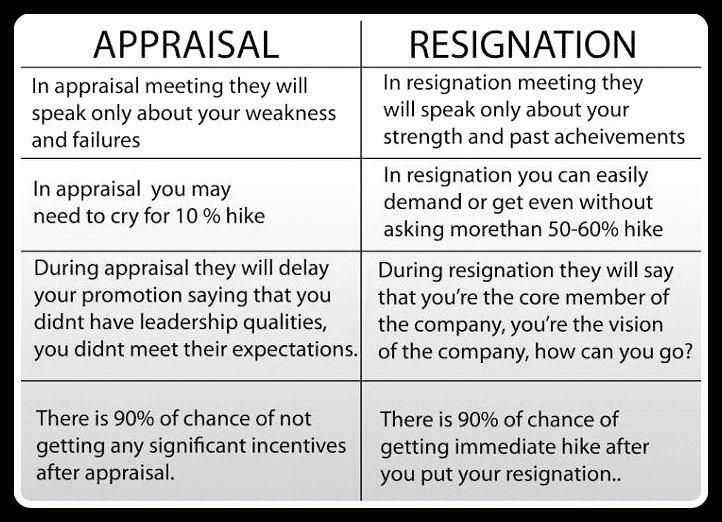 Appraisal vs. Resignation: What’s Your Pick? Admit it, we all have faced the situation where we have been pushed to our extents in the office. It could have arisen out of any cause – ill-tempered boss, incompatible working environment, unsuitable work profile, lack of enjoyment in work, etc. But at times, you would have found yourself in a tricky situation where an appraisal may be in plans and at the same time, you might be considering putting in your resignation. 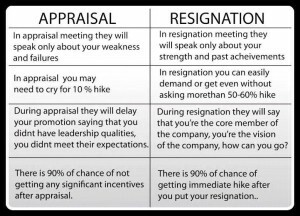 How do you approach the infamous appraisal-resignation dilemma? You might be thinking that an appraisal could bring you benefits and this is not entirely incorrect. Sometimes you may be surprised with the incentives that are provided to you as part of your appraisal. But most of the times, the appraisal would earn you a meeting with the head honchos where your weaknesses and failures would be discussed and you would be compelled to move back to such an extent that you would not be able to bargain for even 10% hike. Another probability is that your promotion could be delayed on the basis of lack of leadership skills, inadequate technical expertise or a myriad of other reasons. And even if you manage to somehow prove your worth to them, there is a good chance that the incentives that would be provided to you after appraisal would not be that significant. The moment your resignation reaches the concerned authorities, you would be called for a meeting to discuss the reasons that compelled you to resign from your position. Unlike an appraisal meeting, you would get to hear about your strengths and achievements and you would be made to feel like an important contributor for the organization’s success. There is very little chance of the management allowing you to leave and they will try to coax you into retaining your employment. The first thing that they do is to give you the freedom to negotiate your salary and even if you ask for a 50% – 60% hike, they would agree (in most cases). Moreover, there is an evident n90% chance of receiving a hike in your salary after you have put in your resignation. Does this Imply That You Should Resign For Getting Incentives? You need to understand when, where and how you should play your cards. If you repeatedly pull off this trick, then instead of being called to a meeting, you could end up with an approved resignation. You should know the implications of the resignation and in order to ensure the safety of your financial sources, you need to actually search a job or you should amass enough funds with which you could last a few months in the dire situation where you not able to find employment immediately. Resignation should always be the last resolution and not the initial approach. Moreover, do not compromise with anything when negotiating things during a resignation meeting. If things are not working out in your favour, then it is best to leave the organization rather than being grumpy about it and affecting the working environment altogether. In any situation, you should always have your resume / CV with you and make sure you keep it updated as per the latest trends and industry requirements. There are various cv writing services in India and you even have some really good online CV makers where you can get your CV create by industry experts. This helps to increase your chances of securing a good job. So think a lot before putting in your resignation, but once you have made up your mind, then do not compromise your requirements for anything.